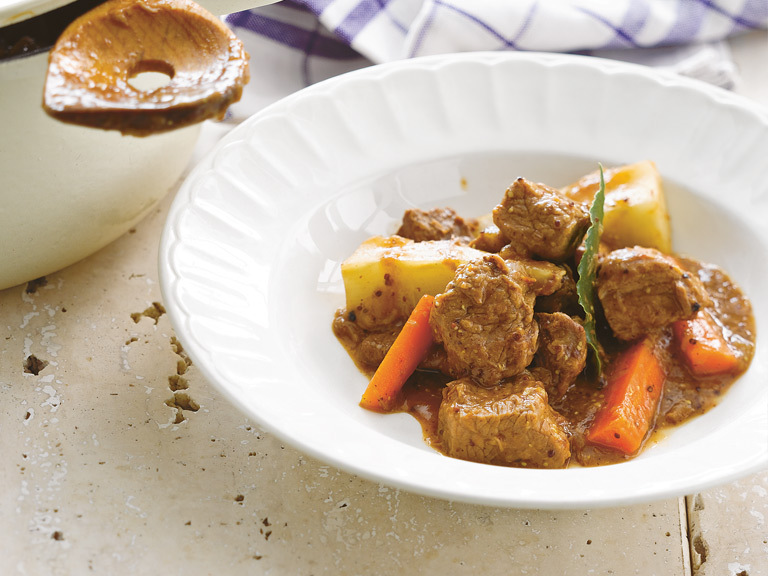 A warming slow-cooked one-pot beef casserole that's perfect for the colder months. Heat the oil in the casserole over a medium heat, add the beef and cook until browned on all sides. Add the onions and fry for 2–3 minutes. Add the carrots and parsnip, season with salt and pepper and continue to cook for 3–4 minutes until the onions are soft. Add the apple, garlic, tomato ketchup, sugar, vinegar, thyme and bay leaves, stir, then pour in the ale. Cook for 2 minutes, stirring to remove any browned bits stuck to the bottom of the casserole. Pour in the stock and bring to a simmer. Spread the mustard over one side of the bread and place it on top of the casserole, mustard side down. Cover with the lid and cook over a low heat for 1 ½ –2 hours until the beef is tender. If you prefer a thicker sauce, thicken the gravy by mixing the cornflour with a little water. Stir it into the casserole towards the end of the cooking time and cook for a further 5 minutes until thickened.